On Thursday, Simone Biles completed a feat that no woman has pulled off for 20 years -- winning back-to-back world and Olympic all-around titles. Since the event was introduced to the Olympic programme in 1952 only Soviet Union duo Larisa Latynina (1960) and Ludmilla Tourischeva (1972), Czech Vera Caslavska (1968) and Ukraine's Lilia Podkopayeva (1996) have bagged the double. And now Biles. When Simone Biles stood on her bare feet ready to mount the balance beam on Thursday, it seemed like she would need to get on her tiptoes to peer over the 1.25 metre (4.1 feet) apparatus. But what the 1.45 metre Biles lacks in height, she more than makes up in stature. 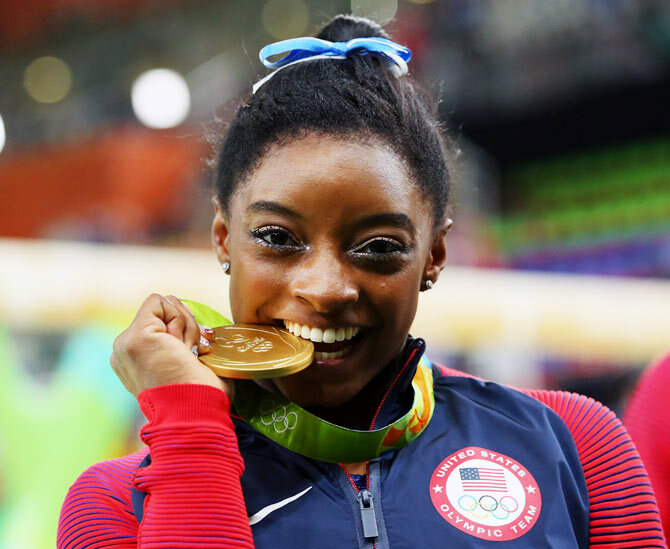 The American stood head and shoulders above all her rivals on Thursday after she was crowned Olympic all-around champion. For American team co-ordinator Marta Karolyi, who has enjoyed a five-decade coaching career, there is only one other gymnast who can be compared to Biles. "She is right on the top," Karolyi, who along with her husband Bela steered Romanian Nadia Comaneci to the first perfect 10 at the 1976 Olympics, told reporters. "Along with Nadia ... both of them. For me, the first Olympic champion and the last Olympic champion they are together. They are special," added the 73-year-old, who will retire from coaching after the Rio Games. That puts Biles above many great gymnasts that Karolyi has worked with in a long and distinguished career. She helped Mary Lou Retton to become the first American to win an Olympic all-around gold in 1984, had a hand in Kerri Strug's heroic vault at the 1996 Games and guided Olympic all-around champions Nastia Liukin and Gabby Douglas among others. 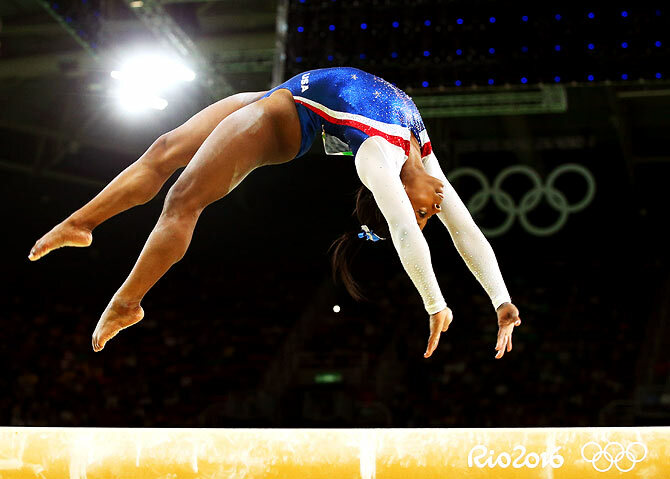 Since making her debut at the 2013 world championships, the 19-year-old Biles has become an unstoppable force. Last year she became the first woman to win a "three-peat" of all-around golds at the worlds. In Antwerp, Nanning and Glasgow she flew through the air faster and higher than her rivals, completing her acrobatic tumbles with solid landings. Those skills also helped the gymnast nicknamed '$imoney' to become the most successful female athlete at the worlds -- with a record haul of 10 gold medals. "She flies higher than anyone, has bigger difficulty value than we have ever seen, but what is even more impressive is that she delivers in the big meets," 2004 Olympic men's floor champion Kyle Shewfelt told Reuters. "She is the most powerful, dynamic gymnast I have ever seen. "She is breaking records left, right and centre. At these Games she now has two medals and she could win another three so her bags are going to be a lot heavier on the way home." Biles, though, wants no part of the debate. "Someone could say I'm the best but then there is a whole different side of people saying I am not. So, I just stay out of it. It is what it is. I just do my gymnastics," she said after collecting her second Olympic gold in three days. On Thursday, Biles completed a feat that no woman has pulled off for 20 years -- winning back-to-back world and Olympic all-around titles. 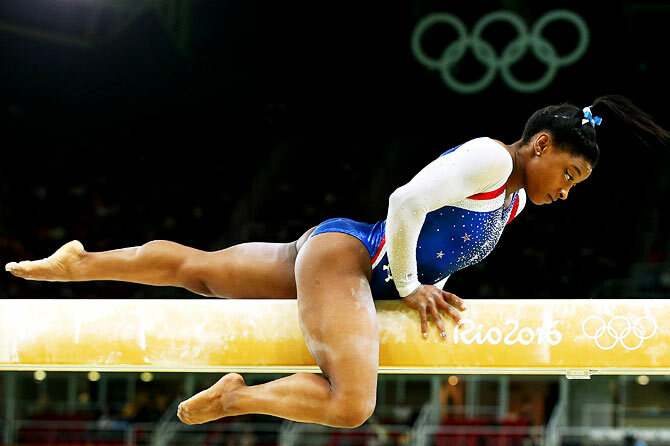 "Just because you are at the top doesn't mean you can stop, you have to keep going," said Biles. The American was too young to compete at the 2012 Olympics, but she was a senior at the start of the current Olympic cycle in 2013. That meant sustaining her levels for four years, a stretch that is beyond most elite gymnasts but not Biles. "Some girls in generations before thought that by winning one world championship or winning two, they think they arrived at the top," added Karolyi. "My advice is ... you are just as good as you are today. So you never can think I am done. Every single day you have to become better and better and Simone responded very well to this advice and I am so proud because of this. "The longevity at this level, three world championships and an Olympic Games, I don’t think is precedented."